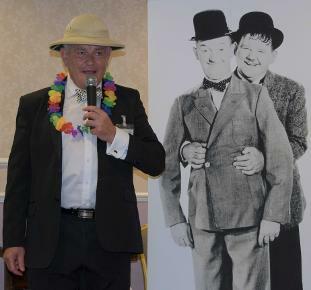 Welcome to the official website for the 39th UK Laurel & Hardy convention, which will take place from Friday 3rd May - Monday 6th May 2019 at the Holiday Inn, Haydock. Hosted by the Dirty Work tent of Wigan. Please join us in a fun-packed weekend of entertainment. 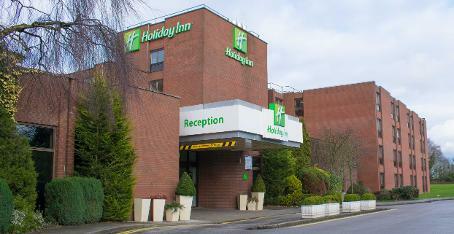 We will be spending three nights at the Holiday Inn, Haydock. 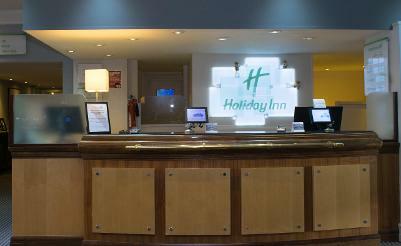 The hotel is located just off junction 23 of the M6, right next to Haydock Park Racecourse. 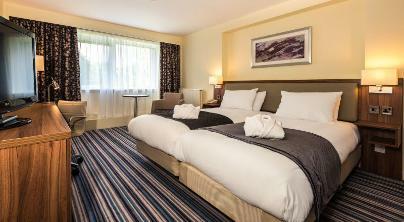 The rooms are very modern in style, with a host of facilities, including a gymnasium, sauna, jacuzzi & swimming pool. 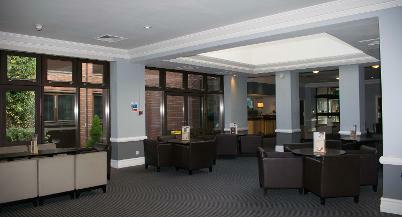 For those of you who prefer a more traditional convention style, there is a pool table, lounge area and fully stocked bar! 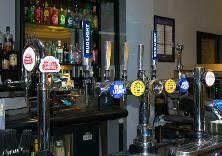 There will also be a selection of traditional guest ales on sale. The running order of the weekend will be presented by highly renowned Master of Ceremonies, none other than the infamous Sir Ian Parker. We will be flying him by private jet, all the way from Aspull to our venue in Haydock! What are we doing down there? 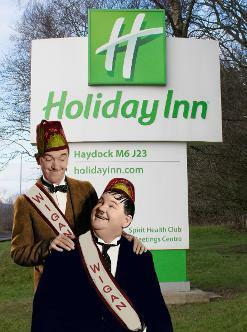 FRIDAY - "Welcome to Wigan"
Our 'At The Ball' disco will take us late into the night, or relax and mingle in the lounge with fellow Sons. The option to get spiffed is also a very popular choice! SATURDAY - "Media City, Manchester"
Explore the rest of Media City at your own leisure. 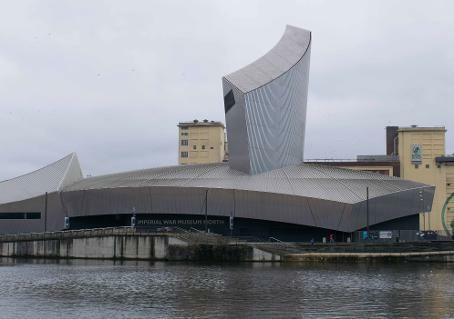 We will also be visiting the Imperial war museum and there are a selection of shops in the Lowry Centre. 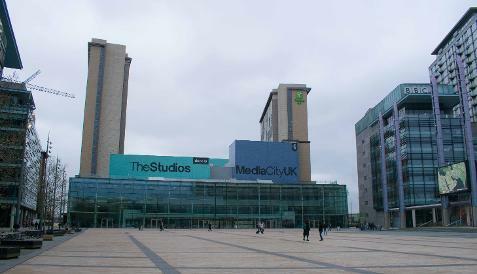 After we have all enjoyed our day at Media City, we will be returning to the hotel to enjoy a nice evening meal, followed by another night of entertainment. This will begin with a surprise item not mentioned here, followed by "Sons Entertain." This is a regular thing at our conventions, where are conventioneers provide their own unique performances. 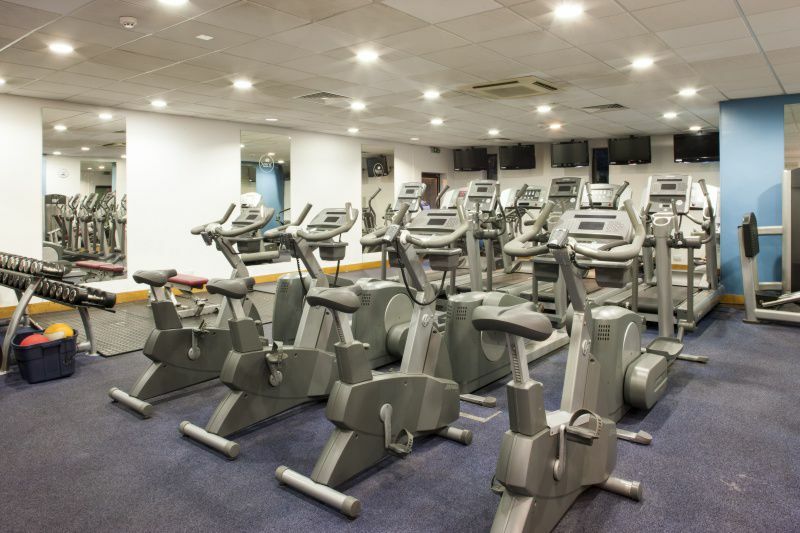 If you're not completely satisfied with the Sons own brand of merriment, then maybe you could serenade us on our late night karaoke party or dance the night away with the disco that will follow. Sunday - "The Laurel & HarDay"
An extra Laurel & HarDay this year at the Holiday Inn, where we will begin with another nice breakfast, followed by a day of fun & games around the hotel grounds. A premiere of an exclusive film will be screened, followed by a new version of 'Quiz of the Desert' & the more official 'Intra Tent Quiz.' 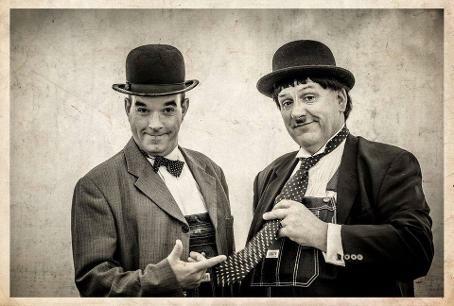 Laurel & Hardy lookalikes Stan Slade & Robbie Graham will also be entertaining us with their close up magic and posing for photos. After we have savoured another evening meal, we will be having a fancy dress party, raffle and prize giving ceremony. 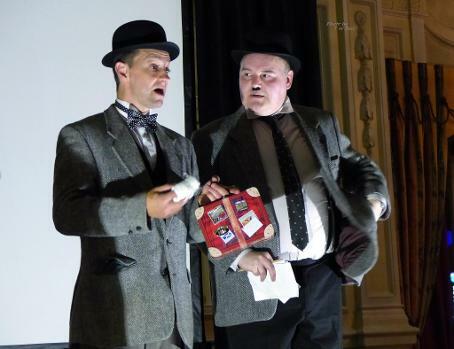 To entertain us later into the evening, we have 'Lucky Dog Theatre', performed by Philip Hutchinson & Tony Carpenter. Monday - "We're Going Now!" After our final breakfast, there will be the Grand Sheik's council meeting, where bids for next year's convention will take place followed by the passing of the pineapple to the winning host for the 2020 convention. 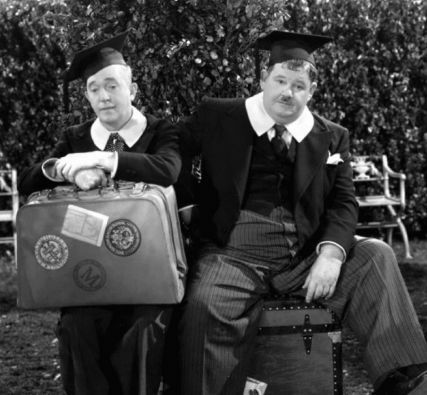 Then it's time to pack up our troubles and say our "Goodbyes" to everyone. Places limited to a maximum of 120 persons so book early to avoid disappointment! 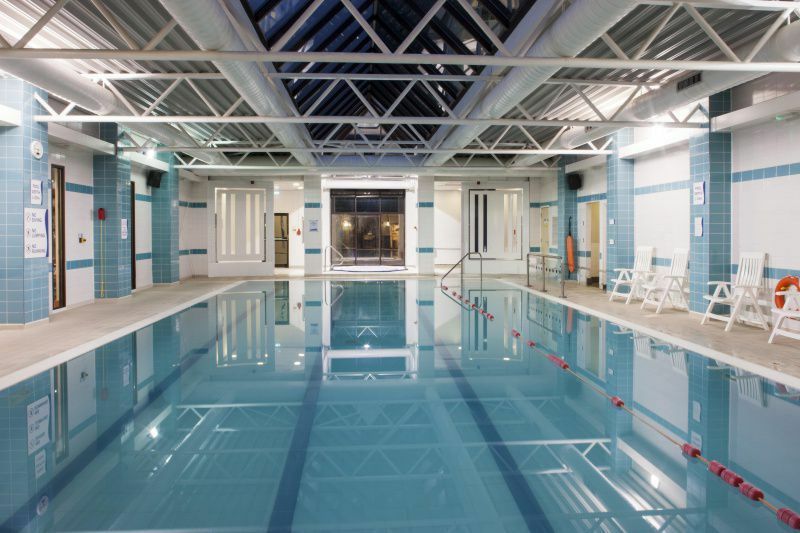 Price includes bed, breakfast, evening meals, lunch on Saturday & Sunday, transportation & admission to BBC Studio Tour & all entertainment provided during the course of the convention.